OnePlus co-founder Carl Pei confirmed to TechRadar in October last year that the company had at one stage looked into making a wearable, but decided to drop it to focus on phones instead. Now we know exactly what it would have looked like. 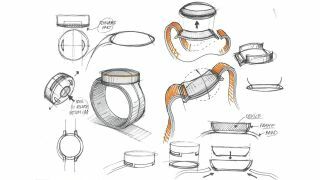 Pei has tweeted some of the original sketches for the smartwatch that were drawn up in 2015. The watch would have come with a removable body so you could switch it out for different straps. A release button resided on the bottom of the watch, allowing you to pop it out the strap - but that would mean removing the strap from your wrist first, which seems a little counter intuitive. The sketches do not reveal whether the watch would have been an Android Wear device or used different software. The drawings are from the early days of development, and the watch may have undergone several revisions before OnePlus finally pulled the plug, so it they may not be giving us the clearest image of what the firm had in mind. Pei said in October, "We asked ourselves, what is the goal? We decided we needed to focus on smartphones, to ensure we're launching quality products and leave the wearables and speakers to the people who know what they're doing." It seems OnePlus will be focusing on phones for the foreseeable future and when the company has made a phone as good as the OnePlus 3 that isn't a problem.